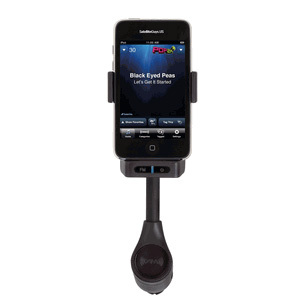 Enjoy Live Satellite Radio anywhere you drive using your iPod touch or iPhone! Get commercial-free music, live sports, news and exclusive entertainment through your existing vehicle radio* with easy Do-It-Yourself installation. Tag songs and easily purchase from iTunes® and expand your personal music library. SIRIUS|XM revolutionary PowerConnect FM Transmitter works through the existing vehicle radio* with easy Do-It-Yourself installation. Easy to move from vehicle to vehicle. Great for traveling. Discover new music to easily purchase from iTunes and expand your personal music library. Works in portrait or landscape mode. Optimizes placement in your vehicle. Charges your iPod touch or iPhone while you listen. XM SkyDock Satellte Radio Tuner with PowerConnect, Magnetic Mount Antenna, Aux In Cable, iPod touch and iPhone Spacers, Quick Start Guide, User Guide, XM Channel Guide.